Find simple solutions to your problems. If you have a question that is not answered here, our Customer Services team are happy to help. Got a question or a problem? Try our Quick Fix Guide first - solutions and information to all the most common queries. Thank you for trying the Quick Fix Guide - if you still have questions or require help then contact customer care services. Vectone Mobile is a pre-pay service offering low call rates for local, national, and international calls, plus savings on SMS and roaming. Vectone Mobile is part of the Mundio Group, a respected international phone network. How can I get a Vectone mobile SIM? 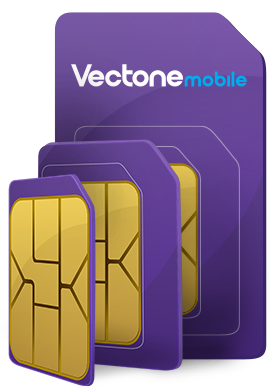 To benefit from the savings Vectone Mobile offers, you need a Vectone Mobile SIM card. You can get a Vectone Mobile SIM card by ordering a starter pack here or from the many shops showing the Vectone Mobile signage. The starter pack is free, but you will need to top-up to start making calls. How do I use my Vectone SIM? 1. Open the packaging and remove the Vectone Mobile SIM card from its holder. 2. Put your Vectone SIM in your mobile. 3. Turn your mobile on and select Vectone Mobile. 4. Enter your Vectone Mobile PIN code, found on the back of the SIM card holder. 5. Add credit by purchasing multifunctional vouchers in-store or online. How can I check my Vectone Mobile number? From your phone press *105# send. Your number will automatically display on screen. How can I retrieve my voicemail? Dial 3331 from your Vectone Mobile or +0759999888 if you are abroad. All voicemail messages (whether played, unplayed or saved) will be automatically deleted after 30 days. I have forgotten my PUK/PIN code. Your PUK code is displayed on the SIM Card holder that comes in your starter pack. Please retain it for future use. Alternatively you can call our customer service team and they will be glad to assist you. Can I keep my existing mobile number, if I chose to join Vectone? You can opt to keep your current mobile number and use it with your new Vectone Mobile SIM. Simply print off the porting form, complete the details and send it to us – we’ll do the rest. How many days will it take to transfer my existing mobile number to my new Vectone SIM? This process will take approximately 10 working days from the date we receive your completed form. When your number transfer has been completed you will receive a confirmation SMS from us. Why can’t I request my number transfer online? Current regulations require that all mobile phone number transfer requests are signed by the customer. Digital signatures are not currently accepted. If I lose my SIM card. Can I move my old number to a new SIM? Call customer service and arrange for your old number to be moved to a new SIM card. You may be asked security questions in order to verify that you are the account holder. Please be advised that it costs 10 € to do a SIM swap. The amount will be deducted from your balance. I have forgotten my login details for My Vectone – how can I get a reminder? Don’t worry. We can send you a reminder – simply provide us with your Vectone Mobile number and the email address you used when registering in the password reminder page. Once you have purchased a multifunctional top-up voucher from a shop, simply key in *101* followed by the 10-digit PIN number found on the back of the multifunctional voucher, followed by the #key, and press call. Alternatively, dial 121 and follow the instructions. From your phone simply key in *102# the call key. Your credit balance will automatically display on screen. How much will it cost to make a phone call? Please check the current call rates. How much does it cost to register for a my Vectone online account? It's FREE to register for a My Vectone account. Once registered, you can check your balance, call history, edit your personal details and add credit. I have lost the signal/network coverage, what should I do? To configure the network manually, find the Vectone Services option. It should be available under the main menu (Android) as Vectone Services or USIM Toolkit or under Settings > Telephone > SIM Applications on your iPhone. On this screen, you will find two options – Automatic and Manual. Select “Manual” followed by “France”. This should allow your phone to reconnect to the network. Click to see instructions to configure your network settings manually for iPhone or Android. In case you still need further assistance, please contact our Customer Services.